Mike Francesa appeared on NFL Network's Good Morning Football this morning looking larger than normal. Mike Francesa asking a lot of his chair. Spoke about how everyone was responsible for his horrific call that the Steelers would blow out the shithole Jaguars by at least 21 points and how the shithole Falcons would knock off the Eagles by at least 10. 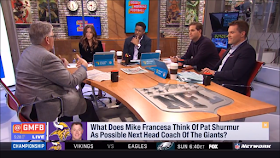 A year ago Fatso Francesa had never heard of nor watched Good Morning Football.